Carbon monoxide detectors in our homes warn of a dangerous buildup of that colorless, odorless gas we normally associate with death. Astronomers, too, have generally assumed that a build-up of carbon monoxide in a planet's atmosphere would be a sure sign of lifelessness. Now, a UC Riverside-led research team is arguing the opposite: celestial carbon monoxide detectors may actually alert us to a distant world teeming with simple life forms. "With the launch of the James Webb Space Telescope two years from now, astronomers will be able to analyze the atmospheres of some rocky exoplanets," said Edward Schwieterman, the study's lead author and a NASA Postdoctoral Program fellow in UCR's Department of Earth Sciences. "It would be a shame to overlook an inhabited world because we did not consider all the possibilities." In a study published today in The Astrophysical Journal, Schwieterman's team used computer models of chemistry in the biosphere and atmosphere to identify two intriguing scenarios in which carbon monoxide readily accumulates in the atmospheres of living planets. In the first scenario, the team found answers in our own planet's deep past. On the modern, oxygen-rich Earth, carbon monoxide cannot accumulate because the gas is quickly destroyed by chemical reactions in the atmosphere. But three billion years ago, the world was a very different place. The oceans were already teeming with microbial life, but the atmosphere was nearly devoid of oxygen and the sun was much dimmer. The team's models reveal that this ancient version of inhabited Earth could maintain carbon monoxide levels of roughly 100 parts per million (ppm)—several orders of magnitude greater the parts-per-billion traces of the gas in the atmosphere today. "That means we could expect high carbon monoxide abundances in the atmospheres of inhabited but oxygen-poor exoplanets orbiting stars like our own sun," said Timothy Lyons, one of the study's co-authors, a professor of biogeochemistry in UCR's Department of Earth Science, and director of the UCR Alternative Earths Astrobiology Center. "This is a perfect example of our team's mission to use the Earth's past as a guide in the search for life elsewhere in the universe." A second scenario is even more favorable for the buildup of carbon monoxide: the photochemistry around red dwarf stars like Proxima Centauri, the star nearest our sun at 4.2 light years away. 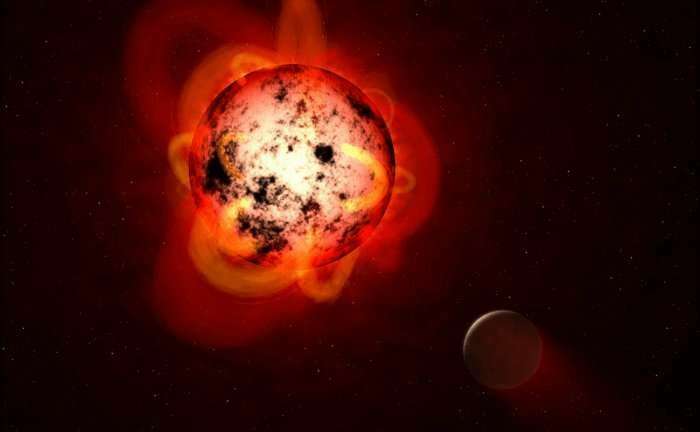 The team's models predict that if a planet around such a star were inhabited and rich in oxygen, then we should expect the abundance of carbon monoxide to be extremely high—anywhere from hundreds of ppm to several percent. "Given the different astrophysical context for these planets, we should not be surprised to find microbial biospheres promoting high levels of carbon monoxide," Schwieterman said. "However, these would certainly not be good places for human or animal life as we know it on Earth." The current study is one component of a broad effort to prepare for these future missions by cataloguing different combinations of atmospheric gases that might be evidence of an inhabited world—so-called biosignature gases. Some gases, such as carbon monoxide, had been proposed previously as 'antibiosignatures'— evidence that a planet is not inhabited —if remotely detectable at sufficient abundance. But those assumptions only apply in specific cases. "Although other studies have done exoplanet photochemical modeling that includes carbon monoxide, no one had focused on carbon monoxide on Earth-like exoplanets in such a systematic way," Schwieterman said. "Now we have a guidebook for determining what levels of carbon monoxide are compatible with a photosynthetic biosphere."